54 Winter 2018 PracticeLink.com features • What's the number-one challenge you're trying to solve by hiring someone in this position? • What would you want the person selected for this position to accomplish in the next two to three months? In the next year? • Is this a new role or a replacement role? W hy d id the prev ious person leave? Or why is the role now needed? The responses to these questions can help you assess whether you're willing to invest the kind of time and energy that will be necessary to be successful in that role. 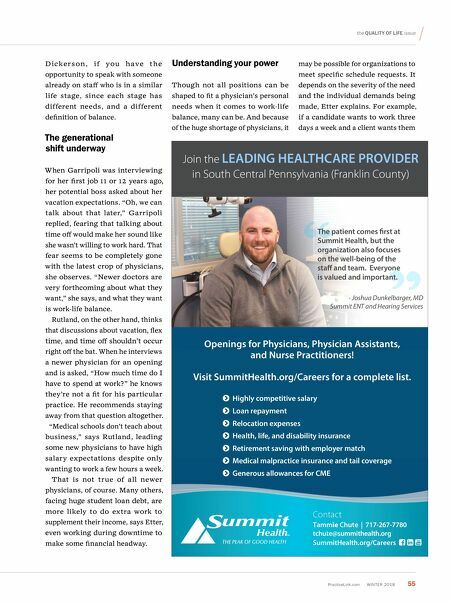 "Organizations realize they have to be honest to prevent physicians from leaving quickly," says Dickerson. While only 5 to 7 percent make a career move because the job they were promised is different from what they were given, Dickerson says, the cost to recruit a replacement is significant. And employers want to avoid setting anyone up to be disappointed. Dickerson recommends looking for signs of the organization's culture, such as: • Are people smiling? • Do they greet one another? • Is the interviewer greeting others? Does he or she know everyone? "A culture of friendliness is aligned with balance," observes Dickerson, so look for indicators that employees are happy and like each other if balance is important to you. Haye recommends asking pointed questions about the amount of personal time that will be available to meet your needs. For example: • "I try to travel to see my parents who live overseas once a quarter. What is the amount of vacation time allocated for this position?" • "I'm in the middle of pursuing an M BA . How f lexible are the work hours?" • "I'm also a caregiver for my grandmother. Would I have the ability to work from home part of the week?" Ideally, the response you hear acknowledges your needs and explains how the hospital or practice can make the situation work. And if you don't hear that, that may be a clue that perhaps a fit does not exist. It's especia l ly helpf u l, says Hallmark Health Medical Associates (HHM A) is a physician-led o rganization with p ractice locations in seve ral communities just no rth of Boston. Physician opportunities: Family Medicine, Psychiatry-Ge riatric, Psychiatry-Adult - In patient/Outpatient, Inte rnal Medicine, Slee p Medicine, Adult Outpatient, Hematology-O n cology, and mo re. Highlights of our physician-led group: • Com petitive benefits and c reative scheduling • O n-boa rding and mento ring p rog rams • State-of-the-a rt p ractice efficien cy models fo r patient- cente red medical homes • Healthca re's Most Wired Hos pital • Long-te rm talented p ractice management staff • Histo ric communities with sho rt commute times and g reat schools • Located just 6 miles no rth of Boston and an easy d rive to the ocean, boating, hiking, s kiing, museums, and mo re. Become a part of the Hallmark team! 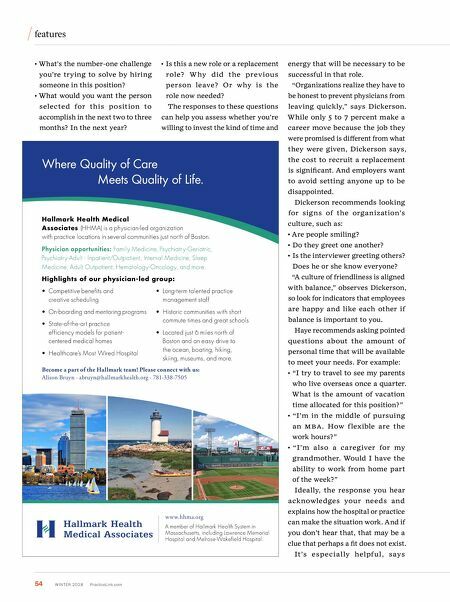 Please connect with us: Alison Bruyn · abruyn@hallmarkhealth.org · 781-338-7505 www.hhma.org Where Quality of Care Meets Quality of Life. A mem be r of Hallma rk Health System in Mas sachusetts, in cluding Law ren ce Memo rial Hos pital and Melrose-Wa kefield Hos pital.